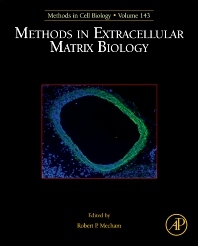 Methods in Extra Cellular Matrix, Volume 142, a new volume in the Methods in Cell Biology series, continues the legacy of this premier serial with quality chapters authored by leaders in the field. Unique to this updated volume are sections devoted to Elastin, Quantification of collagen and elastin, Fibrillins, Lysyl oxidase, Fibulins, Matrilins, Hyaluronic Acid, Small leucine-rich proteoglycans, Syndecans, Fibronectin, SPARC, Thrombospondins, Tenascins, Collagen IV, Multi-photon analysis of ECM, Cell-derived extracellular matrices, Laminins, Fibrillar Collagens, Imaging ECM in developing embryos, Analysis of Matrix Degradation, Ultrastructural analysis of ECM, Versican and Large proteoglycans, and an ECM crosslink analysis. This series covers a wide array of topics about the extracellular matrix, including an understanding of crucial proteins and glycoproteins components of ECM. Dr. Robert Mecham is the Alumni Endowed Professor of Cell Biology and Physiology at Washington University School of Medicine. He holds joint appointments at the professorial level in Medicine, Pediatrics, and Bioengineering. He received his Bachelor of Science degree in Biology at the University of Utah in 1973 where he developed an interest in the extracellular matrix proteins that contribute to vascular function. He continued these studies during his graduate work at Boston University School of Medicine where he earned a Ph.D. in Biochemistry in 1977. Dr. Mecham was recruited to Washington University in 1977 in the Pulmonary Division, Department of Medicine, where his research focused on the underlying causes of emphysema and pulmonary hypertension. After a sabbatical at the National Institutes of Health as a Visiting Scientist, Dr. Mecham moved to the Department of Cell Biology and Physiology at Washington University where his laboratory continues to study extracellular matrix structure and assembly. Dr. Mecham has authored over 250 scientific papers and has edited 13 books. He was the first president of the American Society for Matrix Biology and has two honorary degrees from universities in Europe. He is a fellow of the American Association for the Advancement of Science and has served on editorial boards of major scientific journals. He has held numerous national and international scientific leadership positions and has served on important review and policy committees at all levels. At Washington University, Dr. Mecham twice served as interim chair of his Department. He has extensive involvement in medical and graduate school education and has received the university’s Distinguished Teacher Award three times and the Outstanding Faculty Mentor Award. Over 40 students and fellows have trained in his laboratory and have gone on to research and teaching positions in universities throughout the world. In recognition of his outstanding research and contributions to Washington University, Dr. Mecham was recently awarded the Carl and Gerty Cori Faculty Achievement Award.